It is time for the first big wash! 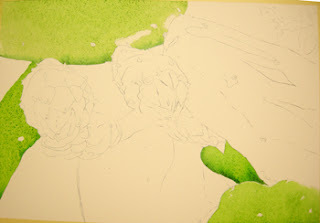 I used a very wet mixture of Permanent Sap Green and Aureolin Yellow. You can see how wet the application was by the little puddle of paint at the bottom of the wash area. 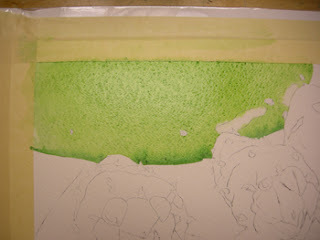 I used this mixture around the painting to work in the preliminary green washes on the cactus leaves. You can vary the mixture here and there as the photo reference and your preferences dictate. I used some Hookers Green in some areas where I wanted to indicate shadows. If you would like to paint along, please visit my etsy online shop and click on the Online Class icon. For $5.00 you will receive the photo reference and drawing for this painting. I will suggest that you print each lesson/post. This makes it easier to paint along!